← What has the disability movement achieved in North-West Bangladesh? Great report on disability and development. But why hadn’t we done it before? “We’re delighted“, and “fully agree” with the “landmark” report released by the UK Parliament yesterday. Disability and Development is a series of recommendations to the Department for International Development (DFID) outlining both why it should and how it can strengthen its commitment to disability. It was welcomed so warmly by organisations working on disability because it brings together what we’ve been saying for a while. I’ll go through the why and how of disability inclusion described in the report, and then the question I want to ask in this post is – if this was so clearly the right thing – why hadn’t it been done before? Those of us that work on disability know the why of it. This hasn’t always been clear to DFID officials, however. This report sets it out – if you want to take seriously working with the poorest of the poor, or with the aim of “leaving no-one behind”, then you need to work with disabled people. Putting this in terms of DFID’s Value For Money agenda, the report points out that “the cost of excluding disabled people from development work is much greater than the cost of including them”. Oh, yeah, and also disabled people have human rights so maybe we should work for that too. So how should DFID do this? Two of the principle recommendations are for DFID to make a clear strategy on its disability work and for it to include it in “reporting and accountability” (i.e. there will be internal mechanisms to make sure it actually happens). The good stuff doesn’t stop there – the report further recommends that to do all of this DFID will need to get more staff working on disability, make closer relationships with Disabled People’s Organisations, and work with governments as well as multilateral partners to make sure this happens. This is all brilliant, and if implemented “would have a dramatic impact on the lives of a billion people globally“. (Disclaimer: and not an insubstantial impact on the funding prospects of people like me or the NGOs welcoming this report). My concern is that we’ve know the way forward on disability for a while, and plenty of the research has come from DFID itself. Why didn’t it happen already? I now see two answers to this question – one is that work has been going on, and then a second answer that explores the different things that restrict work in this area. Colleagues based in London and Geneva tell me that efforts from development agencies in Bangladesh (including DFID) are in fact ahead of that in other countries – that disability inclusion is happening here. Disability interventions, even without proper mainstreaming, are ongoing – and certainly an improvement on 10 or 20 years ago. This report can be seen as part of ongoing work, a success of both disability organisations as well as DFID itself in raising this issue at a policy level. Another point is one that I’ve raised previously – when we go to measure disability inclusion, we might find it higher than we expected. 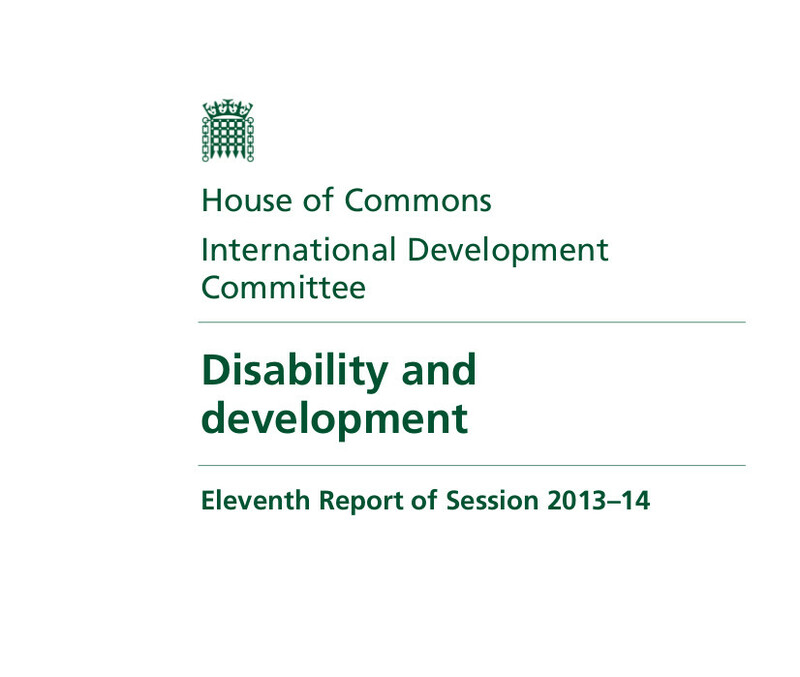 Now some of the reasons that DFID finds it difficult to address disability have been addressed in this report. A lack of high-level commitment, for instance, can be a real barrier in a large bureaucracy. This direction from Parliament and the positivity of a Minister might be what was needed to go forward. Combined with a strategy, specific targets, and including disability in operational plans and reviews mean that – on paper at least – everyone in DFID will need to address disability to some extent. Hiring more staff will be useful too. But there are further reasons it’s hard to work on disability. Maybe the way DFID currently works isn’t necessarily compatible with disability inclusion. Emphasis on results-by-numbers might exclude people with disabilities. When I hear of an example like that of the borehole in Uganda (that was made with steps, without a ramp) I wonder whether this happens because because the people doing things on the ground are rushed and delivering one-size-fits-all solutions. I often feel that way development projects are designed and implemented isn’t responsive to individuals’ situations and their needs – and if this continues then people with disabilities will still be excluded in practice, even if they have been “included” in the paperwork that describes the intervention. The “ambitious commitment” that this report recommends sets a high bar for DFID. I hope they will respond with self-reflection about the way they work. What is it that needs to be changed about the way we do things now to make sure we are including disabled people? Strategic direction and internal accountability aren’t the only answers here. Comments Off on Great report on disability and development. But why hadn’t we done it before?